She had come to Tennessee from Kentucky and told me how her father Wilbur had found a murdered girl in a field near Georgetown in the 1960s. Yahoo-based Cold Cases group was one of the first of these such "virtual" gathering places and out of it grew organizations such as the Doe Network, so called because John or Jane Doe is the name used by the FBI for the unidentified. It was one of the most profound and fulfilling moments in my life. And, I was soon to find, it would have a deep impact on others as well. Already the discovery of her remains in 1968 had led to the establishment of the Kentucky State Medical Examiners Office. Then, 30 years later, the discovery of her identity in 1998 led to the creation of a state-based website by the Kentucky Medical Examiners office, called UnidentifiedRemains.net. Rules and methods have evolved to make the process work better. Data must be validated for accuracy by communicating with law enforcement authorities, and the Doe Network has a protocol which volunteers must follow to prevent them jeopardizing cases or putting themselves in danger. Documentary examining the growing use of the worldwide web by amateur detectives seeking to shed light on cases of murder and missing persons that the police have given up on. Todd Matthews from Tennessee is just one of a network of amateurs trying to help the authorities solve these cold cases. Announcer: Internet Sleuth's - In the USA it is thought that there are over 100,000 missing persons and at least 6,000 unidentified bodies. With the authorities unable to resource investigations into them all, amateur detectives have turned to web-sites, pod casts, databases, and even e-mail to assist police and medical examiners solve cold cases. This is the story of Internet Sleuths. (Introduction): Hi, I'm Todd Matthews. Using the Internet I try to match the missing with the unidentified. Todd: ...This is a good example. This is the Los Angeles County Coroner site. They have a disclaimer that some of the photos and information might be disturbing to some viewers. This is just exactly like if you walked into a morgue and they pulled out the drawer, throw back the sheet to view a body. That is exactly what you are going to see on the web site. Can you imagine standing there if they pulled back the sheet on your child? This is what you're getting, but you're getting it through the Internet. (Introduction): I'm John York, Sheriff of Livingston County, New York. Sheriff York: We're upstate, about 300 miles north of New York City, 70 miles east of Buffalo and Niagara Falls. Very unfortunate on this particular case that we are talking about on November 9th of 1979, we had a young girl who was shot once over the right eye, dragged into a corn field, shot through the back, stripped of identification and 27 years later we are still trying to who this child is...she is somebody's child and somebody has a right to know what happened to her. And she has the right to the justice of identifying her killers. Todd: Over 100,000 missing persons in the United States alone...and globally...think of the anguish of the parents and all of the siblings...the people that love these people. I think it is sort of a quite tragedy...the 9-11 tragedy was huge...a lot of people died at the same time. But there are far more missing that died at the 9-11 attack. And there are, officially listed, over 6,000 unidentified bodies. That's the ones listed with the FBI-NCIC, but we know that is only 10-50% of the actual numbers. There are groups that have done studies, and are confident that there are probably 40,000 - 50,000 unidentified in the USA alone. Sheriff York: We are in route back to route 5 and the town of Caledonia, which is about 25 miles from the office, we are going to the scene where Jane Doe was found. I have always been perplexed and amazed that somebody could kill somebody, dump them and then drive on a kill somebody else with no remorse. We have done everything humanly possible, run down over 10,000 leads on this case. Todd: The Doe Network is a group of volunteers that have come together to try to pull together the world of the missing with the world of the unidentified. Hopefully to match a few of them up and put them back to where they belong. Called Doe Network because of the moniker that the unidentified bodies have are John and Jane Doe. We have been able to help identify more than thirty. Thirty bodies that we actually have been able to match to the missing. To me that almost seems like a low number thinking at all the hours we have out in on it. A lot of the time we have taken a case out of the basement, all but forgotten, brought it back to the surface with an actual police report filed so that it actually once again and active case. Sheriff York: I think the Internet is one of the main potentials for the resolve of the whole case. Because you can get to such a large targeted audience, and more and more people become interested in difficult crime cases. Jill Bennett (Missing Pieces, Episode 3 Guest): ...just to bring her home and give her the proper Christian burial that she deserves. Wayne Leng (Missing Pieces, Episode 7 Guest): 69 missing east side women...women who were drug addicted and involved in prostitution. The reports weren't taken seriously. Tracie Fleischhut: The Internet is the greatest tool, simply because you can get so much information to so many people so quickly. Eric Meadows (Missing Pieces Co-host): I want to say welcome to all of our listeners out there this Tuesday evening. You’ve joined us for yet another episode of Missing Pieces hosted by Todd Matthews and myself, Eric Meadows. And, I want to welcome everybody to the station tonight. How are, how is everyone? Todd: Yes, Ms Tracie Fleischhut, an old friend of mine. And, I think she’s got a lot to tell us now. She’s with New York Missing and the Center for Hope. And, I’m hoping she'll tell us a little about that. Welcome, Tracie. Todd: ...let’s see, where did we first meet? Now, it was on the Cold Case discussion group, and you were, what brought you into this world? Tracie: I was actually researching a cousin that our family had lost contact with. And, I found an unidentified woman that actually fit her description. It turned out not to be her, but that’s how I sort of got drawn into it. Sheriff York: Leaving route 5 and entering route 20, and where she was shot and dumped roadside is about 500 yards down the road form here. It's actually an open field right now, it's been plowed and the corn turned up, where we are going to stop is exactly the area that was all full of high corn at the time. It was where there was a small road side pull off...where this tree is one the right. Sheriff York: Since we have arrived that the scene here, we have went out into the field. There's now snow on the ground, but in that November there was not...it was very cold and drear day, it rained for about 11 hours prior to finding her here, it obliterated almost any physical evidence. We dug up the ground where she was laying and we checked every inch of this area, we recovered any physical evidence that we could, part of which is still part of the case. We actually recovered the spent bullet that had gone through her body and we able to do ballistic analysis. Todd: A lot of people will same "amateur detective....amateur sleuth"...but you know after almost 20 years of working on something like this you would think there would have to be some type of profession, because people are coming to me and people like me for help. Sheriff York: The man who first found her owned this land, still owns it, and is still a very active farmer in the community. They planted corn in it long before and they still plant corn now and I'm sure they'll still plant corn long after. Todd: This all started, for me, back in 1987 when I met my future wife Lori. Her family came here (to Tennessee) from northern Kentucky. At my school, she just appeared one day in the cafeteria one day. I remember seeing her across the room and she just caught my eye instantly, I really want to talk to that girl. I think I had already fallen in love with Lori. Lori Riddle Matthews: I was 16 years old when I met Todd, he still spends all of his spare time doing this work, and it does get overwhelming. He spends every waking hour...it's his life. Todd: ...Lori mentioned "Tent Girl", she was called the Tent Girl because she was wrapped in a canvas tent tube. I think this gave her an identity without and identity. Lori said that it was her dad that had found the body of the Tent Girl. He was about the start a job, he was a well driller. He saw something in this wrapper, and thought that maybe it was an animal. He kicked it with his foot, it rolled down the hill and he saw that it had a human form. He actually went down and stuck his knife into the bag, and the odor that came out was overwhelming. Murdered, blunt force trauma to the skull, put inside this tent tube. I wonder after all of this time still if she might have still been alive, because her fingernails had been broken off...and I wonder if she had tried to scratch her way out of that bag. Lori: Todd was determined that he was going to find out who she was. We went to libraries and we spent every weekend going through newspaper articles, trying to get everything we could get --- and this was before the Internet. When he got the Internet, there was no stopping him. Todd: A lot of us feel that we are advocates for the dead. The missing usually have the family advocating for the missing. (Introduction): I am Rosemary Westbrook, my sister was missing, I thought maybe that she had found another family. When you are 10 years old you can imagine anything. I really, really did not take it to heart until I had my own son. I thought..."What if something happened to Brian?" -- What would I do...how far would I go to try and find him? I thought if I was that determined thinking of my own child, I should be that determined with my sister. Todd: You know about 10 years ago, before having the Internet; the World simply did not exist beyond the community in which I grew up, beyond the rim of the mountain. For me, outside of television, there was no knowledge of the outside World. This was a very isolated area. And I think this is the reason the Tent Girl was taken into the heart of the community where she was found. Rosemary: So in 1995, the one reason why my husband let me get onto the Internet was so that I could look and see. It was like the song..."You can find anything you want at Alice's restaurant". Getting on the Internet was kind like that, you could find anything and look anywhere in the world. So than I had a very small computer, very slow. I started going to missing person's message boards where you could post a missing person. Todd: There were message boards where people would sell thing and there was "lost and found". Then people started looking for missing brothers and sisters. I thought that maybe I should post about the Tent Girl, created a web-site. It was January...and I saw a message that said..."sister missing...last seen in the Lexington area in December of 1967. Then a description, so I e-mailed Rosemary. Rosemary: So I called him and he said, "I think I know where your sister is." I though that this was the first person who had ever told me anything like this. He asked me some questions and he said that his father in law had found a body in 1968 and this might be your sister. He said that "I don't want your money, I'm not an investigator, I just want you to call the Scott County Sheriff's Office and tell them that you want to talk to them about the Tent Girl." (Introduction): I am Bobby Hammons of Scott County, Kentucky. Sheriff Hammons: You get a lot of call in this business, tips and things...normally we check them all out, but this one...a 30 year old body laying up here that no one knew. Now he's been on the Internet and thinking that he came up with something. It was a cold case and still an open murder case right today. Rosemary: He gave me a web-site to look at, and when I read what was on the tombstone, it was like looking into a mirror. I remember that she had long brown hair, always had real pretty nails. She was always smiling and would take me to get ice cream. I remember the kid things...picnic's and her spending the night, us dancing on the front porch to the beat of a little Panasonic record player with a 45 going round. I remember a red painted front porch and we had a squiggly sidewalk, daddy always planted white mums up and down the side walk and the front porch was painted red. I remember her and I...and you look up to your big sister...standing there both holding hands, dancing back and fourth. I remember that and that is all I've got. I sent picture of her and they sent them to the Medical Examiner's Office, there was enough evidence that they exhumed her. You talk about something that was tough...wondering..."Oh my God, what if this isn't her? I will have disturbed the dead, something that God had planted right there." Sheriff Hammons: We dug the grave up until we hit white plastic, when we touched that, they stopped digging. Dr Craig, she gets down in there and starts digging the rest by hand. (Introduction): My name is Emily Craig, and I am the Kentucky State Forensic Anthropologist. Basically I am responsible for decomposed bodies and associated body parts, charred and skeletal remains that are found anywhere in the Commonwealth of Kentucky. We had a photograph of the smiling victim, and we also had a photograph of the teeth at autopsy, and they were an identical match but that still wasn't quite enough. So we did the exhumation, and we got DNA from a sister of the victim, and that gave us the positive ID that we needed from DNA. Sheriff Hammons: It was snowing that afternoon. It was a nice day them all of a sudden it started clouding up and started snowing and was real cold. She was standing there, and found a hip bone; it had little grooves in the joint. She said to look at the grooves and that when they get 21 or 22 years old they start filling in and these had already started filling in. She said that she was going to say that this body was from a person that was 23-25 years old. Todd: There's and etching of the Tent Girl there, etched into the head stone. Not meant to be a portrait but a representation, it was taken from the autopsy. Looking at this, I can almost say that I am looking at a picture of Rosemary on that stone, just like her now that I know....now that I know what I know. Todd: Bobbie was her nickname...Barbara is Bobbie. Rosemary: September 12, 1943 to December 6th of 1967. Rosemary: ...brings back a lot of memories. I tool a real pretty picture up here last time I was up here...it had snowed. Rosemary: I have that picture on my laptop. Dr Craig: I think these people that handle these web sites, especially those from the missing and the volunteers that try to match both sides of the equation are ABSOLUTELY AMAZING. They have done more than government agencies have over the decades. I think it is a common condition that government agencies and medical examiners offices are just absolutely overwhelmed. These cold cases, once they grow cold need something to keep them alive. (Introduction): My name is Investigator Gloria Coppola; I'm in the bureau of criminal investigation with the New York State Police. Most of our current cases are homicides and in between current cases we will work cold cases. Every so often I'll do these searches on the unidentifieds...living and deceased. Every body has computers and everybody is on the Internet. One of my missing persons cases a young man who went missing from Albany County, I got a tip from somebody who was looking at the websites, they had found an unidentified and the photo were almost identical. The teeth were similar; we actually had to compare fingerprints before finding that it was not a match, that's how close it was. Todd: There is a protocol; it is required in the case of the missing that it has a police report before we work on it. One should never publish data without the permission of law enforcement, without their knowledge. It could jeopardize a case, so in your attempt to help a case you could actually destroy an effort. You might be following a tip that the Sheriff knows well already, but he has chosen to be silent and waiting for an opportunity. Investigator Gloria Coppola: I don't have the time to be cruising databases all day; I can do the federal and state ones. But I'm not always on the Doe Network...I will use it and I think it is invaluable. I love it when we get these crime tips from people, I think that is great. Obviously there are down sides to some of it. Todd: You often have very over zealous people that have wild fantasies, or fascinated with serial killers. Investigator Gloria Coppola: I'm probably the most suspicious person out there, that's been my life for 27 years. Trying to determine if a person is lying or are they telling the truth. However it isn't like we are getting thousands of hits every day, and yes it could waste your time if it is something so far fetched. But after a while you get know if something is worth following up on or not. And I have to tell you if a case becomes cold after a while, that far fetched tip might be the most current lead that you have, so you might want to see what they are offering. Todd: As far as the Doe network is concerned we try to use our regional people in their particular states where they are posted. You try to use the relationship that they are building with law enforcement. It's not always easy to find the right person to put there that can do that and follow the guidelines. Jill: Basically whenever I get online, every day, I’m doing something that pertains to somebody that is missing or murdered, because that is my main focus. My screen saver is a collage of faces of missing and murdered people...because these faces are just a part of my everyday life. 2002, I started working with the Carrie Culberson (Featured on Missing Pieces, Episode 3) case. Her case was my first; she disappeared on August 28, 1996. The boyfriend is serving life without parole. It’s kind of controversial because of the fact there was a conviction without the body. We have never wanted anything except just to bring her home and give her a proper Christian burial that she deserves. Todd: It's addictive, because you sitting here and you think..."I'm going to quit and go to bed"...then you see that 30 minutes has passed...then another 40 minutes has past...then you get the final call from your wife letting you know that it is time to go to bed. I get up at 3:30 in the morning and sometimes your here up past 12:00 at night. You can't just stop because there no real place to stop, the e-mails keep coming. Dr. Emily Craig: I think it is important to caution the amateur sleuths to the fact that they are amateurs. And sometimes they will want to push in a direction that we know that we just can't go. We can accept the information and the tips from the amateurs, but we simply can't reciprocate and give them information about the investigation. Todd: Leoma Patterson now that case is an interesting case (Case Featured on Missing Pieces, Episode 10 ). She has been missing since the late 1970's, and her family was given a body, but they didn't feel like the body was hers. The clothing didn't match, the jewelry...they didn't feel like was her jewelry. Barbara Adkins (Introduction): I am Barbara Adkins. Pearl Smith (Introduction): I'm her sister Pearl. Barbara Adkins: It happened back in 1978, she got missing...my mother, Leoma Patterson. Todd: People like me help untie the knots and take it back to law enforcement. Trying to take away all the discrepancies and that type of thing. That's the way I approached this case, we had to look at..."What do we know and what do we not know?" Barbara Adkins: We reported her missing and they told the family to look for her, so we got out in the snow and ice and we looked for her ourselves. Pearl Smith: Three months after she got missing, the skull and a few bones...that's all they said they found. Barbara Adkins: They released these remains to the family, after the held it for seven years, they released it to the family on a boy's confession of killing her. He's in prison now in the state of Georgia; he committed two more murders there. Ever since then we have been trying to find out the truth. Pearl Smith: As far as getting anything done, I wrote letters to everyone in the country because none of us had any money to do anything with. I wrote to the Governor, I wrote to the State's Attorney here. I even wrote a letter to the President. Barbara Adkins: We kind of put our money back through the years me and my sister and our brother Ronnie Patterson. We saved our money and hired a lawyer and we got the body exhumed. We never really thought it was her, back then they didn't have DNA. Todd: At this point in time it appears that this body that they have had buried in their mother's grave is not their mother...according to the initial DNA test. Even though the state of the remains often cause a little controversy in the validity of a DNA test. Todd: Now so many people expect you to just reach into the Internet and pull out the answer to their problems, and you can't...it's not that easy. It wasn't like I entered in Tent Girl and out popped Barbara Hackmann Taylor. You can't just catalogue though it and pull it out like a bar code, it's not like that. Even with the Internet, even though it was the tool, it still took a lot of work to use that tool to find what we were looking for. Barbara Adkins: We hope to get this person identified. Maybe somebody will come fourth after seeing all this in the media and might be able to tell us something about our mother. She would be 82...if she were alive. Pearl Smith: I want to know what happened to her and where's she's at...and I want to know who we buried. Because whoever was in that grave has got a family too. Todd: There are a lot of people on the Cold cases group that are people that are actually really working in law enforcement. Retired people some of them, there are medical examiner's there, a lot of professionals that are looking into this new world of doing things on the Internet. Rather than the world where a group of detectives meet in a room...this is the whole planet. There are people from everywhere. If a child were to go missing in Australia...we can know about it within seconds here in the USA. We can criss-cross the globe in minutes. Investigator Coppola: There are obviously thousands of police agencies, and as Ted Bundy the serial killer said..."Police don't talk...that's how you get away with it, police do not communicate." Unfortunately that's true, I'm a big proponent of talking and sharing information but unfortunately that doesn't happen all the time. We have to communicate more; we have to have shared databases...to me that is a key. Central repositories where information comes in...missing persons, unidentifieds, homicides are there trends? Are there patterns? Geographic patterns? Sheriff York: If you saw the file cabinets, there are drawers and drawers and drawers...and over 10,000 leads that we have run down on this case. You can see from her necklace here that she was wearing...a turquoise necklace with three little birds on it. She also had two key chains...and one key chain said, "He who holds the key can open my heart," and the other was a key that fit in to that corresponding slot. Our hope is that someday, on the Internet, someone will look at that and say... "I know that child." It's one of our best chances. Some day...we are going to solve this. 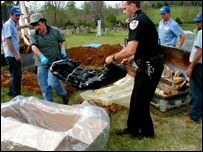 A body in Tennessee is exhumed for a new autopsy. Joins BBC news for special interview. 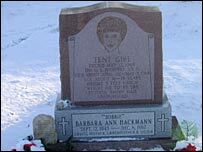 After lying unnamed for 30 years, Tent Girl's name was added to her grave. 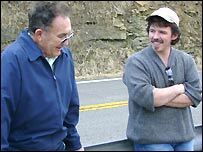 Todd with his father-in-law Wilbur Riddle, on location for the film "Resurrection"
from people searching for their missing loved ones"